Johnny has been racing since 2009 and driving fast boats his whole life. He races with his father, Jason – himself a 3-time National Champion. He helps run the family business, Performance Marine/ Saris Racing Engines. He has raced everything from small outboards to stepped vees and spent a lot of time throttling. 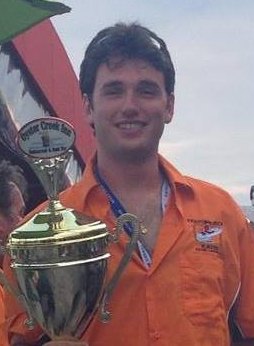 In 2010 Johnny became the youngest driver to win a World Championship Offshore Race at the OPA Worlds in Orange Beach, AL. The 2012 Amsoil Offshore Powerboat Series covered on Fox Sports Net (FSN) spends a lot of time on him and his rivalry with the other young drivers. In 2014 they ended up 3rd in points with a 2nd in Ocean City, MD and a win in Solomons, MD.